There are many styles and price options when it comes to choosing an enclosure and protecting your investment. 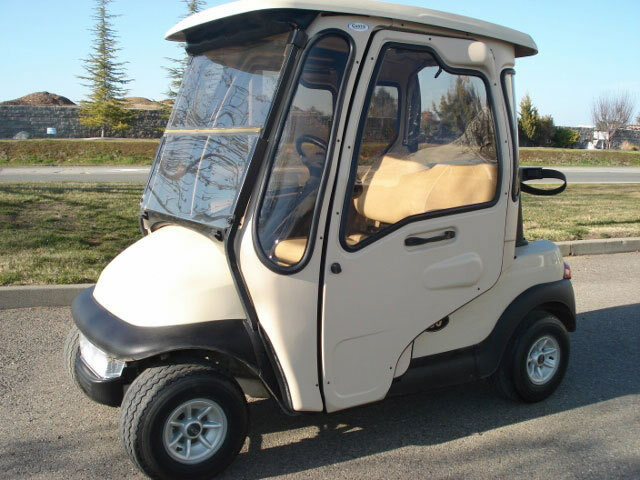 Our custom enclosures are top of the line and give you the best quality and highest comfort level. 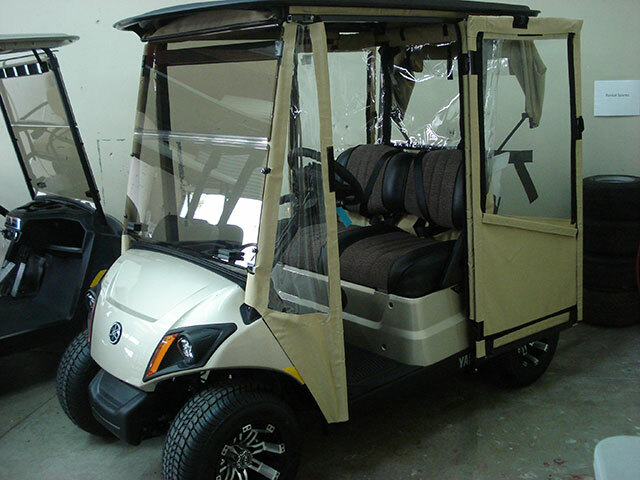 We have narrowed down our after-market enclosures to 2 different model-specific types: over-the-top style and hard door / cab system. Our universal enclosures are available for all models; with an attractive price and a 4-sided style, these enclosures will absolutely get the job done. 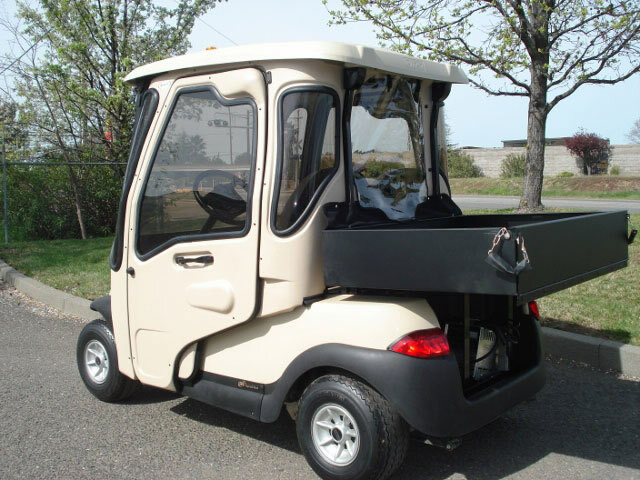 Over-the-top and universal enclosures are usually in stock and available with the shortest lead time. 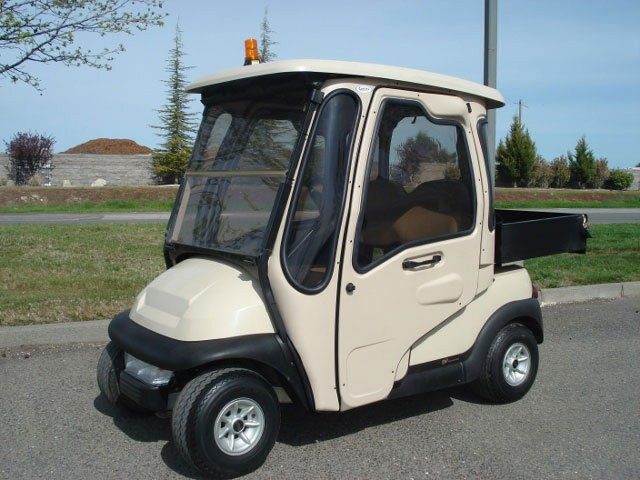 Below are examples of the Custom, After-market, and Universal Enclosures we provide. Please call our knowledgeable staff for help choosing the right enclosure for you. 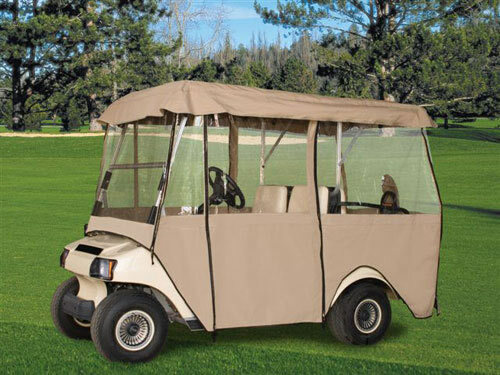 Our Sunbrella Track-Style enclosures are designed to keep the wet weather out, while providing style and durability. 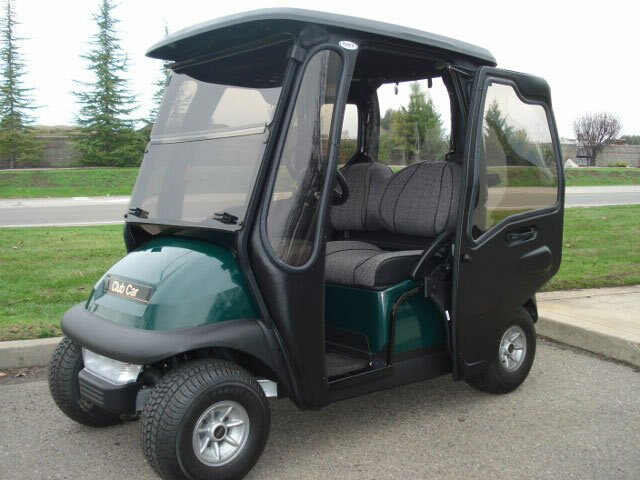 Featuring an interchangeable / removable valance, curved heavy duty zippered doors for wider openings, high quality 20-gauge clear vinyl windows, and a 3-year warranty. 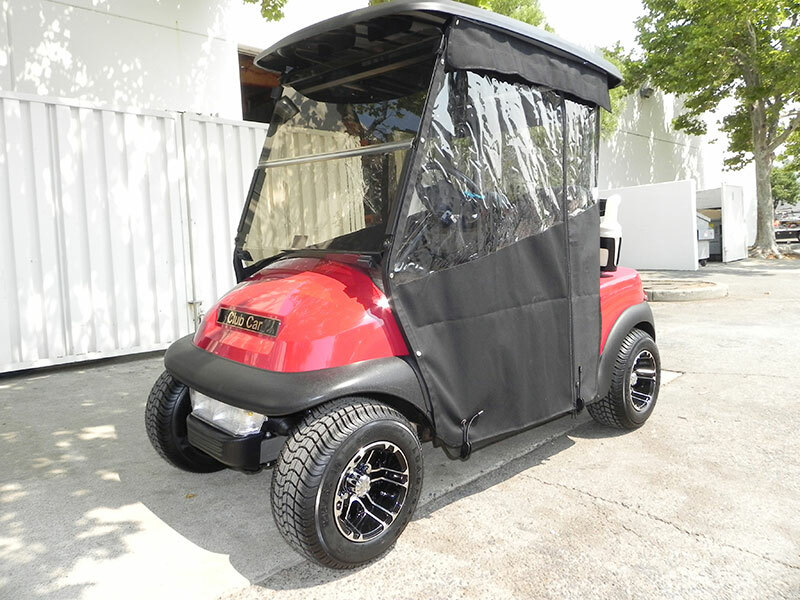 Available for most Club Car, Yamaha, and EZGO models. 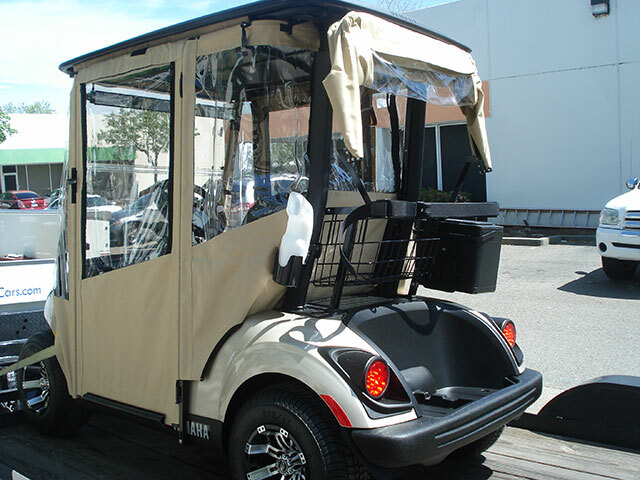 Our over-the-top style after-market enclosure is make and model specific, so it will fit the latest golf car models available. 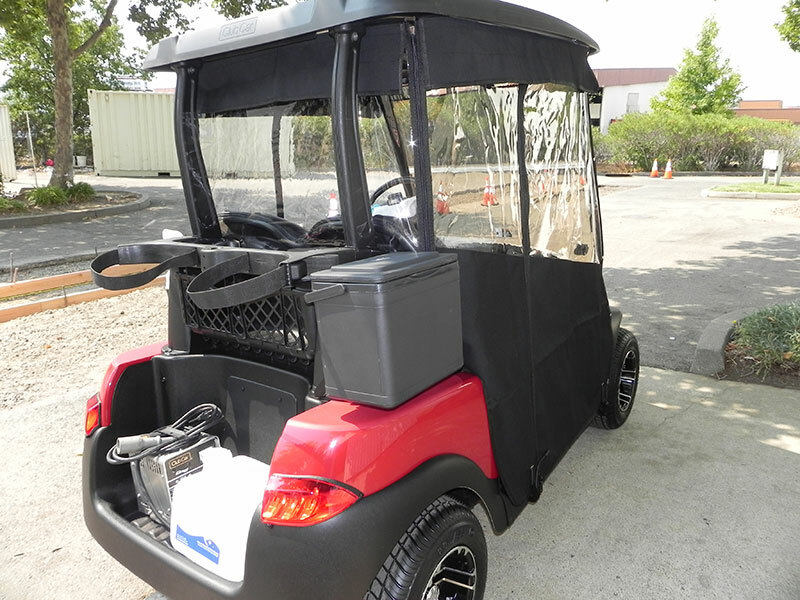 This is a great enclosure if you are looking for a better look and a longer life expectancy than the universal enclosures, or if you are looking for an affordable option compared to the custom enclosures. 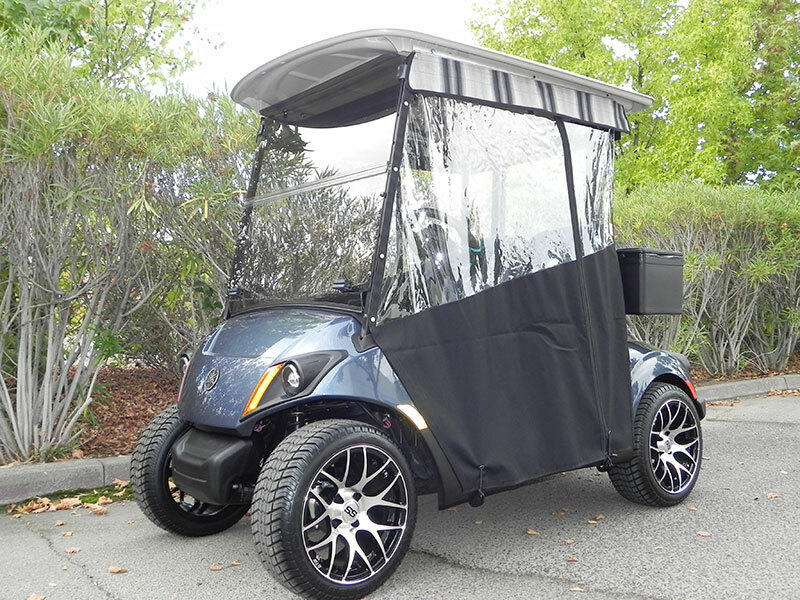 They are 4-sided with zip-off front windshield. 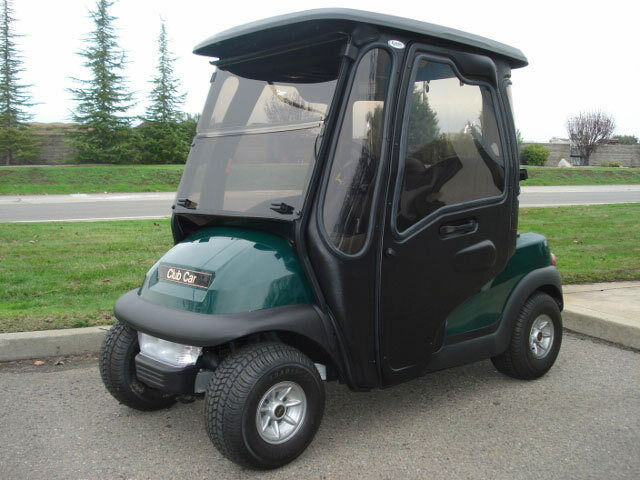 The Curtis StreetPro Cab System features parallel opening doors that offer a Swing Back Door Action for a complete, enclosed system, free of the elements. 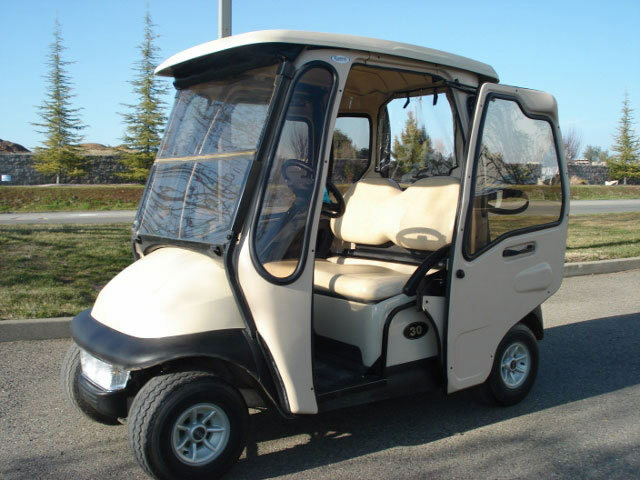 Available for the Club Car Precedent, EZGO RXV, and Yamaha Drive / Drive2 models. 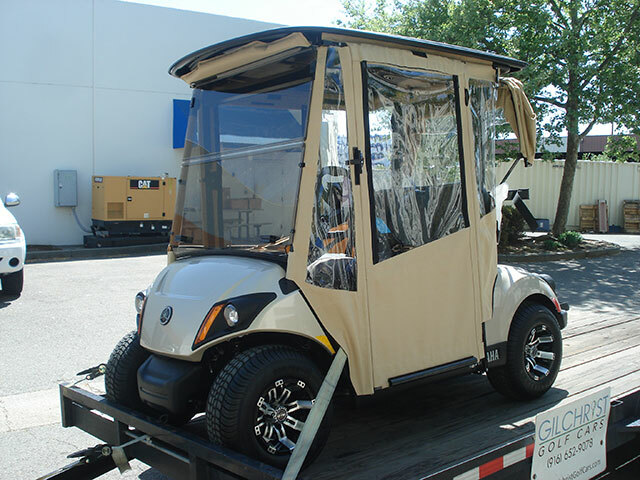 The DoorWorks Hinged Door Enclosure is made to fit most major golf car makes and models including Club Car and Yamaha. 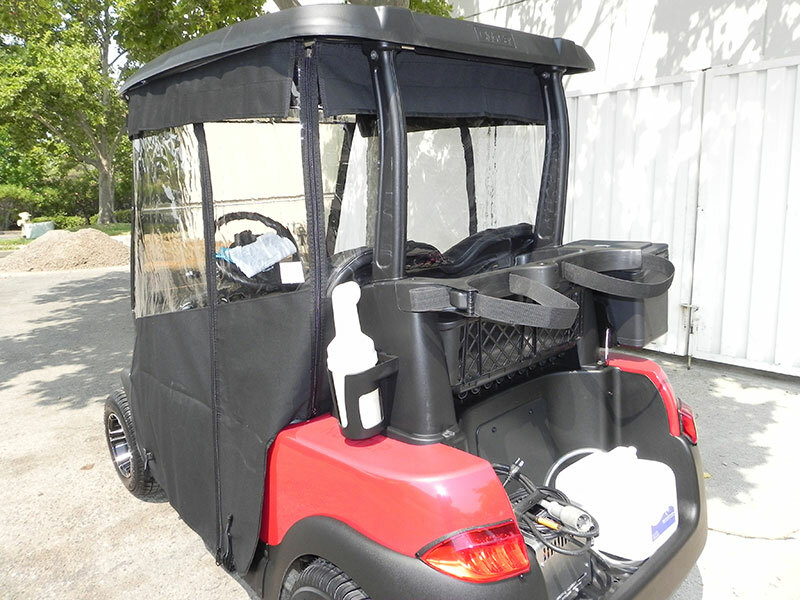 The patent hinged door solution makes getting in and out of the golf cart very easy. 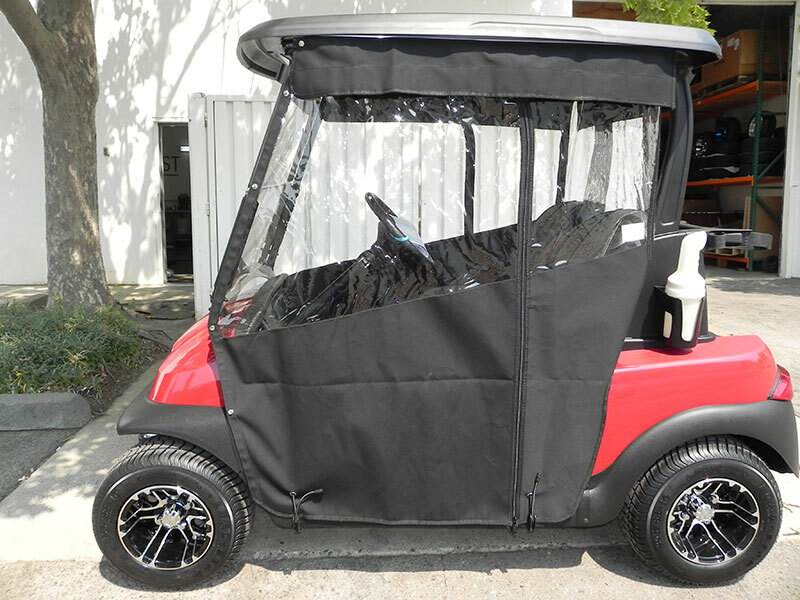 Available in Vinyl and Sunbrella, and the hinged doors now come standard with zippers in both door windows and the rear window. If affordability is the priority, our universal enclosures are the perfect fit. 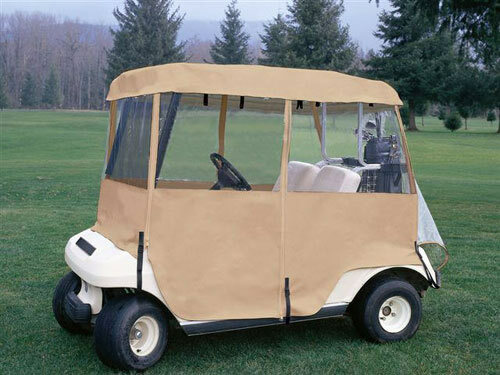 Available for 2, 4, or 6-passenger cars, these 4-sided enclosures will absolutely keep the elements out of your car. 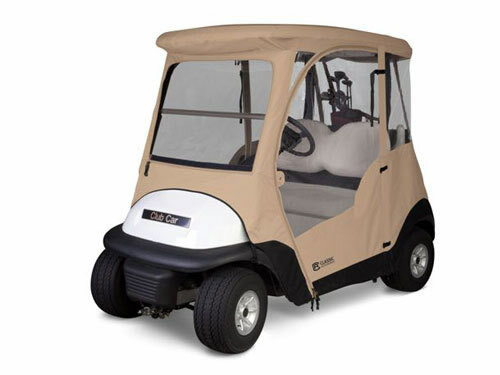 They will comfortably fit all makes and models and allow for quick installation without tools.